DeAndre Johnson, a quarterback who once suited up for Florida State and was featured on the Netflix series “Last Chance U,” signed with Texas Southern University on National Signing Day. The quarterback was dismissed from Florida State in July 2015 after punching a woman in a bar. He played at two small colleges after being kicked off the team at FSU. 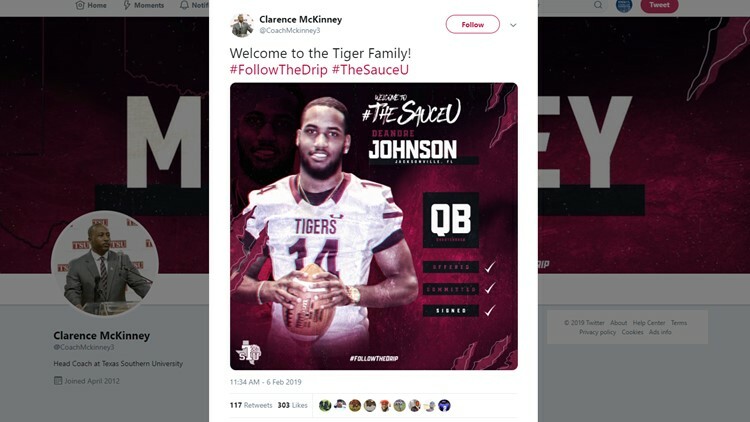 HOUSTON — DeAndre Johnson, a quarterback who once suited up for Florida State and was featured on the Netflix series “Last Chance U,” signed with Texas Southern University on National Signing Day. Johnson is one of five players who signed letters of intent Wednesday. He and three other players who are transferring to TSU spent time with a Power 5 conference program. Wide receiver Montel Parker and defensive lineman Michael Johnson transferred from Texas A&M and Baylor, respectively. Donnie Corley, a wide receiver who transferred from Coahoma Community College in Mississippi, spent time at Michigan State before heading south. The five signees were added to the 15 players who were added during the early signing period. The group of 20 includes five Division I FBS transfers, five junior college transfers, and 10 high school players signing letters of intent. Johnson is transferring in after spending a season with Florida Atlantic. The quarterback was dismissed from Florida State in July 2015 after punching a woman in a bar. According to the CBS Sports, Johnson was an early enrollee at FSU. He was suspended in late June and was charged with misdemeanor battery, and was dismissed from the program by early July when security video of him striking a woman was made public. Johnson entered a plea deal later that year which required him to participate in a sheriff’s work program and serve six months probation, according to CBS Sports. The quarterback ended up at East Mississippi Community College where he was featured on the second season of Netflix’s documentary series “Last Chance U.” The show highlights athletes with difficult pasts who end up playing football at the community college level in hopes of getting a scholarship again. Texas Southern head coach Clarence McKinney announced the National Signing Day class at a press conference Wednesday. "These kids are coming in here and buying into the program," McKinney said of his first recruiting class at TSU. "I think the players we signed – in the early signing period as well as this signing period – I think those guys are going to help us reach the goals that we've set." East Mississippi Community College also provided TSU with a pair of defensive backs – twins Jacob and Joseph Anderson. TSU's other junior college transfers are linebacker Sherry Durand IV, a Houston native who played at Tyler Junior College, and Nathaniel Hines, from San Diego, Calif.; Hines started his collegiate career at Mesa Community College in Arizona. The Tigers also welcome 10 incoming freshmen to the team. Six of them will be competing for time on the offense: Quarterback Brysen McKinney (Arlington, Texas/Mansfield Summit), running backs Jacorey Howard (Houston, Texas/Aldine) and LaDarius Owens (Manvel, Texas/Manvel), and offensive linemen Marque Johnson (Missouri City, Texas/Hightower), Jack Nance (Houston, Texas/Clear Lake), and Trevyon Robinson (Missouri City, Texas/Hightower). The defense welcomes four freshmen: Cornerback Ja'Corey Benjamin (Houston, Texas/Alief Hastings), defensive lineman Tyler Martinez (Humble, Texas/Humble), linebacker Jadrian McGraw (Newton, Texas/Newton) and defensive lineman Viramontes Pippens (DeSoto, Texas/DeSoto).